Hattie’s™ serves a variety of Southern and Louisiana cuisine, including our award winning famous Southern fried chicken. In addition to our main dining room we offer two other unique dining options: Our French Quarter lounge for full dinners and our Courtyard for appetizers & cocktails. We also offer a Raw Bar located in our courtyard, weather permitting. The French Quarter lounge is perfect for dining, special occasions and late night bar. Since it opened in 1938, “Hattie’s” and “Saratoga Springs” are often mentioned in the same breath. Hattie’s has served fine Southern and Louisiana cuisine in a friendly, down-home atmosphere for close to 80 years and has earned legions of fans. Over its long history, the restaurant has provided consistent commitment to its staff, its customers and the community and the original storefront Chicken Shack™ has grown from a beloved neighborhood restaurant to a national institution. Hattie Gray was born and raised along the banks of the Mississippi river in Saint Francisville, Louisiana, just North of Baton Rouge. Although her mother died during childbirth and there is no official record of her birth, Hattie estimated she was born about 1900. As a young woman, Hattie left Saint Francisville for New Orleans where she went to school and lived for several years. While visiting her sister in Chicago, Hattie met and began working for the A.E. Staley’s, a family that had made a fortune processing cornstarch into household products. For many seasons Hattie traveled with the Staley’s between Chicago, Miami and Saratoga Springs. By 1938 Hattie had saved enough money to leave the Staley’s, move permanently to Saratoga and open Hattie’s Chicken Shack. Describing Saratoga in the late 30’s and 40’s Hattie said, “Saratoga was fast, man; it was real fast. It was up all night long.” Thriving in her Federal Street location for 30 years, Hattie’s was open 24 hours a day providing hospitality to the late-night crowds that frequented the gambling dens, speakeasies, and smoky jazz and blues clubs of Saratoga’s West side. When urban renewal came to Federal Street in the late 60’s, Hattie relocated the restaurant to its current location at 45 Phila Street. It wasn’t just serving good food that made Hattie’s Chicken Shack so well loved. It was what Hattie did for the community that truly set her apart. Hattie and her husband Bill helped countless people — giving them work when no one else would, helping them through school or difficult times, or simply just sitting them down and feeding them. Hattie’s generosity had no boundaries. She treated everyone the same, from the elite to the downtrodden, and she welcomed everyone. traditions established by our matriarch. We care deeply about the restaurant and its place as a cherished community institution. We are blessed with a staff that truly cares and together we will carry on the tradition of great food, ambience and wonderful hospitality to ensure the legend of Hattie’s continues to thrive. Please help us to pass on the legend of Hattie’s Chicken Shack. Chef Japer has recently published his first cook book! 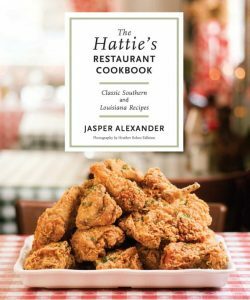 The Hattie’s Restaurant CookBook, Classic Southern and Louisiana Recipes. The Cookbook features over 100 recipes, from Crawfish Boil to Fried Green Tomatoes with Buttermilk Dressing to Cajun Coleslaw to Andouille and Cheddar Stuffed Mushrooms, fill out the rest of the cookbook. Desserts, drinks, appetizers and more, all making it easy for any Hattie’s fan to recreate favorite dishes at home. 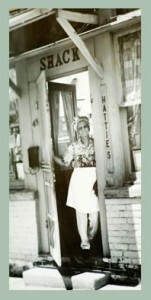 Plus, The Hattie’s Restaurant Cookbook chronicles the establishment’s rich history through anecdotes and photographs. This cookbook is so much more than just a kitchen staple: It’s a testament to one incredibly determined Southern cook and her timeless legacy.